The Corporate Cup is an annual one day tournament, which will take place in the evening, in Terenure RFC in Dublin, on Friday 17th May 2019. Pitching company Tag teams against each other, it offers Corporate Teams the opportunity to compete for the title of Dublin's Top Work Tag Team. A wide variety of industries are represented each year, including finance, IT, media and pharmaceuticals. And with competition really tough each year, the Corporate Cup is a tournament every work tag team wants to win! To regulate this, all participating teams must register their players in advance - with their final squad list of up to 14 players. The work email address of all 14 players is also required. We reserve the right to verify with your company’s HR Department that all players on the team are actual employees! 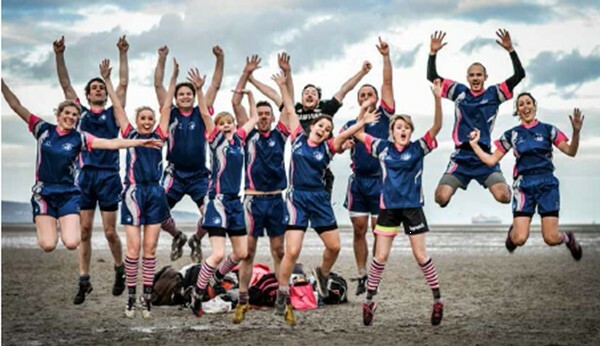 We firmly believe that a fit company is better company - and Irish Tag Rugby Association is the perfect starting point to get your work colleagues exercising, and having lots of fun, on a regular basis! As well as improving everyone's general fitness, Tag is also brilliant for promoting teamwork and improving moral among staff. It is a mixed, soft-contact sport that caters for all ages and sporting abilities, so everyone in your company can get involved. A Tag team is made up of 7 players with a maximum of 4 lads so most teams start with 4 guys and 3 girls. You can then have up to 14 in your squad - so 7 substitutes who can come in during any break in play (similar to basketball etc). To cater for the large number of corporate teams who play Tag Rugby with ITRA, we have an number of Corporate Events tailored especially for work teams and your company can get involved in any of the ways listed below. For more information about any of our Corporate offerings, simply call ITRA HQ on 01 202-0100 or email info@tagrugby.ie. The best way to get involved in ITRA Tag is to register a work team for one of our weekly leagues, with Spring (6 weeks from Mar-May) and Summer (9 weeks from May-July) Leagues being by far the most popular. Games are 40 mins long (2 x 20 min halves) and take place in the evenings between 18:30 and 22:00. Most weeks, you will know well in advance what time you are playing at - worst case scenario is it 48 hours before your next game. We have New to Tag options and Novice Leagues and can organise a Corporate Training session for your team before they commence the league! With over 35 leagues taking place 6 days a week throughout the country, you should be able to find a venue and night to suit your work crew! To see what venues and nights are available in your area, simply click on the link below and enter your Region. We also offer larger companies the opportunity to create their own One Day Tag Blitz. As well as sorting out a venue and suitable date, the blitz can be tailored to suit your company's needs, such as number of players per team, male/female breakdown. Our experienced Event Team will organise and run the entire blitz for you. We arrange everything from referees to equipment and trophies to first aid and can also sort out catering and entertainment (DJ etc) if required. We also offer you the opportunity to hire tag shorts, which is the cheapest way to keep costs down. This should allow you to relax and enjoy the day - all you need to do is provide the players and supporters!